Unfortunately motor oils inside your engine degrades over a period of time. 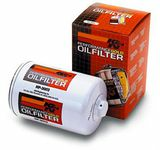 Oil filters are can help your engine remove sludge and particals that can damage your engine. At AutoBarn we carry filters by Fram, Mann, ACDelco, Mobil 1, Beck and Arnley and K and N that can help protect your engine and extend the life of your motor oil. help improve the quality, performance and life span of your engine. Removes more contaminants than conventional filters using an advanced synthetic fiber blend filter media.